A radio message comes in from a Spanish maritime rescue boat to the service’s command centre in the southern town of Tarifa: ’34 migrants rescued’. The onset of autumn-winter, with the cold, storms and fog, has not stopped migrants from crossing the Mediterranean from Morocco to Spain, a journey that has this year claimed the lives of hundreds of youths. From the heights of Tarifa, veteran sailors work in shifts behind radar screens at the rescue service command centre monitoring the Strait of Gibraltar, through which 100,000 ships transit every year. ‘When the weather is good we can see homes in North Africa from here,’ said its head, Adolfo Serrano. Just 14 kilometres separates northern Morocco from Spain’s southern Andalusia region at the Strait’s narrowest point. ‘But with a quickly changing sea, strong currents, fogs that can surprise you, it’s a dangerous crossing,’ added Serrano. It is especially perilous because human traffickers put migrants on packed inflatable boats or plastic canoes that can easily overturn, he said. ‘I can’t remember an autumn like this. Boats keep arriving with pregnant women, children,’ said Jose Antonio Parra, a mechanic of 25 years experience with the Guardia Civil police force’s maritime unit. 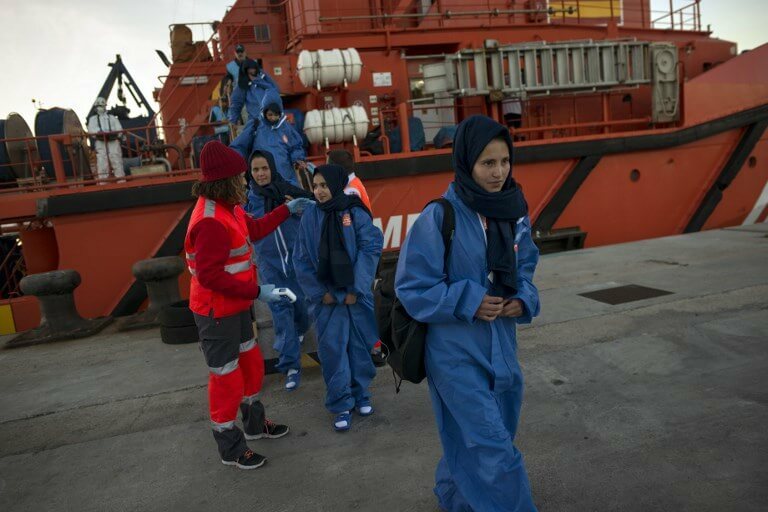 The 34 migrants rescued from an inflatable boat – including six females who appeared to be in their teens – were taken to the port of Algeciras, where they were first attended to by the Red Cross before being handed to police. Small migrant boats are hard to detect by radar. They are often only located when the migrants themselves sound the alarm by telephone. Rescuers did not detect the boat which sunk on 5 November during a storm off the coast of the town of Barbate, an hour’s drive west of Algeciras, killing 23 young Moroccans. Only 21 people on board survived. ‘There was a hell of a storm. Many of them did not know how to swim,’ said spokesman for the Guardia Civil in Cadiz province, Manuel Gonzalez. Andalusia’s regional government took charge of nine minors who survived, while police jailed two passengers suspected of having steered the boat. The other 10 adults who were on board were ordered back to Morocco under an agreement between Madrid and Rabat. Since then, more bodies have washed ashore on other beaches. Nine sub-Saharan African migrants drowned after spending a week adrift at sea, according to the only survivor of the ordeal, a Guinean teenager who saw his brother die, said Gonzalez. The migrants had paid 700 euros each for what they had been told would be a trip on board a rigid-hulled inflatable boat with an engine but were instead forced to take a ‘toy-style boat’ with just one oar, he added. Between January and 2 December, 687 migrants died trying to enter Spain by sea, more than three times as many as last year, according to International Organisation for Migration (IOM) figures. More migrants have died trying to reach Italy and Malta this year – nearly 1,300 – but Spain has become the main entry point for migrants trying to reach Europe by sea. More than 55,000 migrants have arrived in the country so far this year. Rescuers describe two types of migrants: Sub-Saharan African migrants, who sing when rescuers arrive to pluck them from the sea, and Moroccans who try at all costs to reach the shore without being detected because they face deportation back to Morocco if caught. ‘Our boat rocked, there was so much joy,’ Abou Bacari, an 18-year-old who left Ivory Coast two years ago after he lost his job at a banana plantation, told the AFP news agency in Madrid, as he recalled his rescue at sea off the Spanish coast in October. There were 70 people on board the inflatable boat, including four children and eight women, when it departed Tangiers for Spain, he said. ‘Guineans, Malians, Ivorians … we were lost at sea for two days,’ Bacari said, adding ‘even the men cried’ when the boat developed a puncture. On some days – such as last weekend – as many as over 500 migrants can be brought to shore by Spain’s maritime rescuers. ‘I had never before seen a boat just with 45 migrants aged around 14-15 on board. Even the one who steered it, who supposedly worked for the traffickers, was a minor,’ said Parra. It’s now 30 years since the first photo of the body of a drowned migrant on a beach in Andalusia was published. Today rows of tombstones at Tarifa’s cemetery mark where unnamed migrants are buried. ‘Sometimes we find migrants with their names tattooed on their arms in case they die. We are seeing a normalisation of death and that is unacceptable,’ said Jose Villajos, the head of an association that helps migrants founded in Algeciras in 1991. He accused the European Union of ‘using North African countries to stop migration and act a bit like Europe’s police but this policy leads to even more deaths’. ‘When agreements are being ironed out with African countries like Morocco, curiously, the number of migrant boats increase greatly because it is a way to put pressure on Europe,’ he claimed. 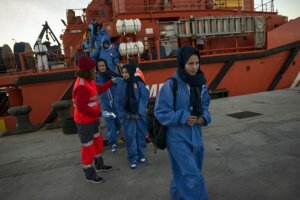 Maria Jesus Herrera, the head of the IOM mission in Spain, said that while it was important to increase cooperation with the migrants’ country of origin to help boost their living standards, Europe must at the same time ‘open regular channels of emigration, which are safe and dignified’. Enjoy the Catalan Pyrenees … plus a music festival.